How does it compare with an index loop? That is also O(n^2). The loop will pass n times, and each remove operation is O(n), so we end up with an O(n*n) solution. The cost to remove a item from a Collection depends on the implementation. Initialize your i to the arrayList.size()-1 and decrement. That will be faster. Backwards is faster but still O(n^2). I agree that the cost of removal is highly dependent on the data structure used. 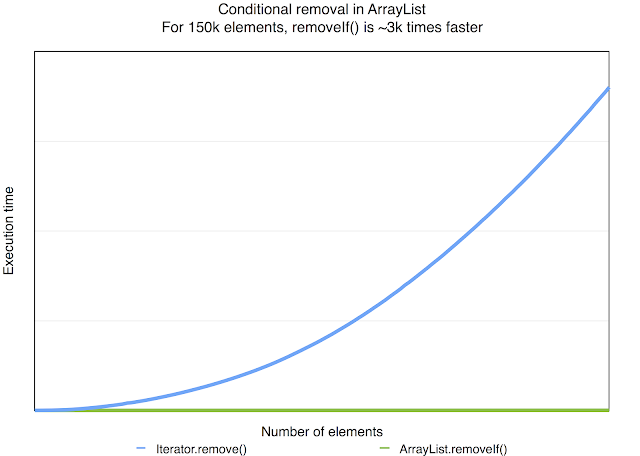 Contrasting with a LinkedList in the beginning, this blog post is intended to cover only the special case of an ArrayList. 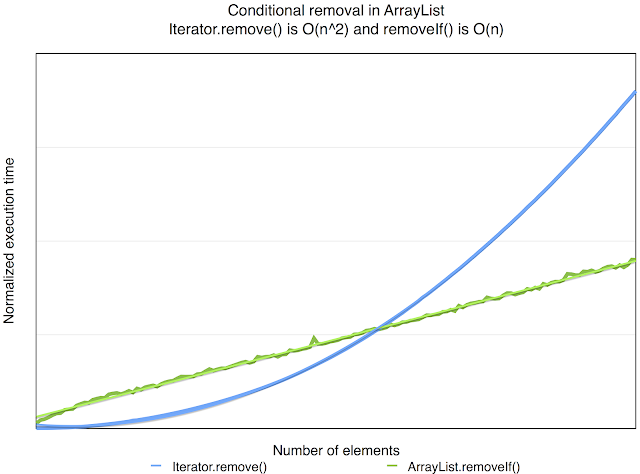 Your solutions also works in O(n^2) time - after each removal all elements in ArrayList will be shifted in memory. I did not intend to convey that I have created any novel solution to the removal problem, on the contrary I meant to point out that the Java 8 remove operation is O(n). Thus, none of the solutions are mine in any sense. I think that your comment beautifully illustrates the reason why the The Java 8 implementation is more efficient. Ignoring any language or implementation details and just considering the problem per se, it is easy to see that removal of elements in an array is O(n) (since it entails relocation of O(n) elements). Thus, solving the general problem of removing n elements from an array by using the basic removal operation will always be O(n^2). The reason for this is that we have introduced an extra constraint to the original problem when deciding to use item removal operations. The basic item removal operation has to maintain the data structure invariants for each loop of our solution, which (as you point out) requires relocation of all elements of higher indices. Does the Java 8 solution silently use multithreading ? Or can it be modifier for this ? As written above, the execution will take place in a single thread. It is how ever trivial to add a ".parallel()" to the stream to make the solution using several threads. When happens then is that the stream is split into chunks of data, to be handled in parallel streams created transparently to the user. Good question, BTW, in some future blog post I will use this as an example of the advantages of declarative programming.